Categorized as: Stories on June 7, 2011. Jolie Biringingwa of Bukavu, the Democratic Repulic of Congo, works to overcome the trauma of being raped during wartime by helping care for her siblings and training to become a teacher. Partner: V-Day with Heal Africa, Goma, DRC. Sometimes healing can span continents and oceans. New-York based V-Day partnered with Skees Family Foundation in California to send V-Peace scholarships to the DRC through Heal Africa. We wish to enable young women such as Jolie Biringingwa to complete school and train for a vocation of their choosing, to end atrocities and begin opportunities. Jolie, one of seven children, was born in 1997. She was raped as a little girl, during the 2002 rounding up of the ex-Rwandan soldiers and the dismantling of the Hutu militia known as Interahamwe, in Bukavu. 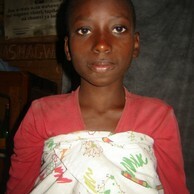 Her mother sells second-hand clothing and must live away from the family in Walikale in order to work. Jolie’s father, a construction assistant, has not been able to find employment but can earn as much as U.S.$5/day when working. Helping with her six sibliings, Jolie lives with her father. They eat two meals per day. Attending Moria Primary School, Jolie has been in the V-Peace scholarship since 2008, receiving help with school fees, uniform, and related expenses. She likes to play card games and calculator games. She plans to become a teacher, and with the ability to earn an income, Jolie has a chance to marry later and by choice, to have the number of children she chooses, and to enjoy food security and perhaps own her own home. Also, Jolie will take the chance she got with V-Peace and use it to advance peace and education in her own community; this is all we ask of V-Peace scholars. It only costs us U.S.$100 per year to assist students like Jolie while they turn their lives from pain into power. Donate directly to V-Day’s V-Peace Scholarships to support more students like Jolie.